Dental anxiety or dental phobia (odontophobia) is one of the most common fears in the world. Roughly a third of all adults dislike visiting the dentist. 1 in 10 of us have an anxiety so strong that it prevents us visiting the dentist. The main problem is that many people avoid tackling their fear of the dentist – which often leads to worse oral problems in the future. We need to all keep our oral health as a priority so with that in mind we wanted to share some of the techniques you can use to overcome dental anxiety. Mild anxiety is simply nervousness at having to go to the dentist rather than severe anxiety that stops you visiting at all. All the techniques here though can help severe dental phobia as well. 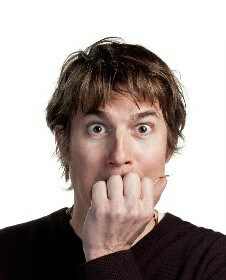 Dentists are people too and are well trained to deal with nervousness and anxiety. If you talk to your dentist about your anxiety they can help you by talking you through procedures or allowing you to take breaks to recuperate, have a drink or relax. Controlled breathing is used to keep your body relaxed and your mind focused. It allows you to lower your heart rate and not think about your dental treatments. We recommend using a simple breathing technique whereby you inhale through your nose for a slow count of three, then exhale through your nose for a slow count of three. The counting keeps your brain focused whilst the breathing lowers your heart rate. This technique helps you overcome the often uncomfortable feeling of having dental tools in your mouth. There are other great relaxation techniques that can help you feel calm at the dentist. Listening to your favourite music during treatments or having a friend with you to provide support, conversation and comfort can make a big difference to your mental state. You might also consider taking gentle exercise before your appointment – as this releases endorphins and will relax your body. The steps above can all be useful tools to treat severe dental phobias and you should try using them all. However, if these fail to help you might consider the following which can help with psychological phobias. Therapy is a great tool to treat the root causes of dental phobia and is available on the NHS for extreme sufferers. A therapist can help identify and treat the underlying causes of your dental phobia. Contact your local doctor to seek this treatment. Thanks to the internet you can now find fellow odontophobes online offering support and help to each other. Sites like DentalFearCentral provide an online platform for people to come together to discuss their fears and find support from each other. In extreme cases sedation can be used to allow treatment to take place whilst the patient is relaxed. Modern sedation techniques mean you will be drowsy and relaxed but still awake. Options are either oral sedation, where you take a pill an hour before your treatment, or intravenous sedation, an injection into the hand. These are expensive treatment options so are only used in very extreme cases. You will still be awake but may not remember your treatment thanks to the induced relaxation. These treatments are only conducted at some practices so it is better to explore other options first.